Antigoni Villa Dio is a beautiful two bedroom Apt, really spacious for a family or party of four persons, located on the upper level of Antigoni Villa, air-conditioned, with front balconies and stunning sea views. 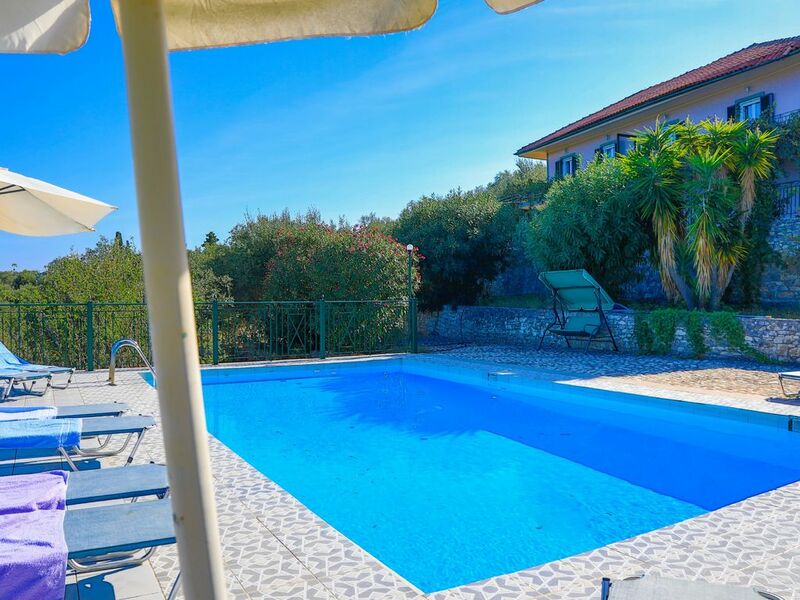 Antigoni villa is a typical Paxos two storey rental property, which boasts three two-bedroom apartments and a private shared pool (10 x 5 m), located on a hillside olive grove in Dendiatika Loggos, neighbourhood of Paxos. It is set in a private plot, with olive trees and gardens and enjoys amazing sea views all the way up to Greek mainland, just 15 minutes walk to Loggos. The following outside facilities are available for your own use:At the front of the property is located the large shared pool, in between a beautiful garden and the sea underneath. It enjoys spacious sunny terraces, sun-loungers, umbrellas. It can be reached via a small pathway. All terraces are shaded by fruit trees and become ideal for dining or relaxing al fresco. Phykia beach is located close by to the apartments, whilst Monodendri and Glyfada beach are just a short walk away. &#8211; Barbecue shared between clients. &#8211; Garden , trees and a gardener that will visit from time to time. &#8211; Water supply is from a private reservoir, so you will not run out of water easily. &#8211; Wifi Internet (Internet is not available in the area yet. The owner provide a 3G hotspot, enough for just emails). &#8211; Iron &amp; ironing board. &#8211; Points of interest 8kms. &#8211; Eos Local Office 8kms. &#8211; Dendiatika, Loggos, paxos, Post Code: 49082., GPS: (39.228138, 20.157504). Pool towels are available . Cleaner:3 times a week, including your arrival. &#8211; Official Check in time is 14:00 hrs. &#8211; Luggage Check in is 14:00 hrs. &#8211; Official Check out time is 10:00 hrs. We can be flexible with check-in and checkout time on request. The cleaner may be in the property even after the official checking time and will stay until cleaning of the property is complete.